Curbside garbage and recycling pickup tends to seem a bit magical, with waste removed and sent away without most consumers ever seeing where it goes. But many U.S. cities are struggling with an overload of recyclables and may soon change their pickup programs, if they haven’t already. The reason behind that big shift has to do with pollution in China and how the global recycling market disproportionately impacts other nations that buy imported paper and plastic refuse and recyclables. For nearly two decades, China has taken in extraordinary quantities of the world’s trash and relied on cheap labor to process it. More specifically, China joined the World Trade Organization in 2001, at which point the country began accepting paper and plastic recycling from around the world, according to a February episode of the podcast 99 Percent Invisible. And according to a new report from Vox , by 2016, China was importing 40 million metric tons of recyclable products every year. The U.S. used to make a fair bit of money from selling off its trash and recyclable goods. But the real issue is what the country will do now, with its recyclable products piling up. There is no national recycling policy in the U.S., which means cities are without a plan to work together to manage domestic waste. As a result, hundreds of cities nationwide have begun scaling back or altogether scrapping with their recycling programs. Trade publication WasteDive maintains a comprehensive tracker of exactly how this policy impacts each of the 50 U.
S. states. Its examples cross cities of all size and demographic and illustrate the breadth of the problem. One WasteDive example includes the more than 30,000 recycling customers of Republic Services in Indianapolis seeing their bills double in 2018, up to the maximum amount allowable by law. Meanwhile in states such as Wyoming, cities and counties are stockpiling recyclable materials until market conditions improve. All of this is leading to even more extreme, longer-term effects. Vox points to an alarming study published in the journal Science Advances that says China’s ban on imported recyclables will lead to a pileup of more than 111 metric tons of garbage by the year 2030. ‘A lot of babies and bottoms’: Can Vanuatu pull off its decision to ban disposable nappies? Made in NYC Stock quotes by finanzen.net Global warming is making oceans so acidic, they may reach the pH they were 14 million years ago Business Insider Deutschland Aug. 16, 2018, 11:36 AM If we don’t curtail our CO2 emissions soon, our oceans could soon be as acidic as they were 14 million years ago, killing off marine life as we know it. According to a study published in Earth and Planetary Science Letters, global warming isn’t the only problem caused by excess CO2 emissions. Our oceans are currently experiencing unprecedented acidification due to rising CO2 levels in the water. If we don’t curb the problem soon, our oceans could soon be as acidic as they were 14 million years ago, killing off marine life as we know it. We already know plastic waste leads to a colossal level of marine pollution and threatens the lives and habitats of many animals and plants. We also know sunscreen can bleach coral and destroy whole reefs and that even traces of drugs can tip the hormonal balance of various marine animals. Man is to blame for a large portion of the damage the underwater world has been subjected to, but as if that weren’t bad enough, it turns out we’re causing the ocean another problem, according to a study published in Earth and Planetary Science Letters. Global warming isn’t the only problem caused by excess CO2 emissions Research conducted by scientists at the University of Cardiff in Wales found that carbon dioxide levels will soon be as high as they were 14 million years ago, when the average temperature on Earth was three degrees Celsius higher. Due to rapid global warming, the pH will have dropped dramatically by 2100. Ocean acidification occurs when the pH of water drops, due to the absorption of CO2 from the atmosphere. One third of CO2 emissions are caused by the burning of fossil fuels, which has been ongoing since the beginning of the industrial revolution: 525 billion tons of CO2 have been released into the oceans since that period began. Smoke is seen from a chimney in Altay, Xinjiang Uygur Autonomous Region Thomson Reuters The ocean’s pH will soon be as low as it was 14 million years ago The scientists examined the pH value of the water and the CO2 content of the past 22 million years. “Our new geological record of ocean acidification shows us that on our current ‘business as usual’ emission trajectory, oceanic conditions will be unlike marine ecosystems have experienced for the last 14 million years,” said lead author of the study Sindia Sosdian in a statement . But even the current pH value is alarmingly low: “The current pH is already probably lower than any time in the last 2 million years,” said Carrie Lear, co-author of the study. She added: “Understanding exactly what this means for marine ecosystems requires long-term laboratory and field studies as well as additional observations from the fossil record.” The catastrophic damage to marine life can no longer be averted Though scientists still have to conduct further experiments to establish the precise ramifications this change will entail within the next next few decades, one thing is clear. If we continue as we have done up until now, the over-acidification will not only kill off existing and future coral reefs entirely; it will cause catastrophic damage to many ecosystems, in which many animals rely on underwater plants for food sources. Read the original article on Business Insider Deutschland . This post originally appeared on Business Insider Deutschland and has been translated from German. Copyright 2019. Follow Business Insider Deutschland on Twitter ..
(CNN) The European Parliament has approved a law banning a wide-range of single-use plastic items, such as straws, cotton buds and cutlery, by 2021. Final implementation of the legislation is expected in the next few weeks. The law, which was supported by 560 Members of the European Parliament against 35 on Wednesday, stipulates that 10 single-use plastic items will be banned in order to curb ocean pollution. MEPs also agreed a target to collect and recycle 90% of beverage bottles by 2029. “Europe is setting new and ambitious standards, paving the way for the rest of the world,” the European Commission’s first vice-president Frans Timmermans, who is responsible for sustainable development, said in a statement. Read More The new plans come after the EC found that plastics make up more than 80% of marine litter, which has disastrous effects on wildlife and habitats. The EU parliament notes that because of its slow rate of decomposition, plastic residue has been found in marine species as well as fish and shellfish — and therefore also makes its way into the human food chain. Saving our oceans from plastic pollution 04:47 Under the new European law, tobacco companies will be required to cover the costs for the collection of cigarette butts and manufacturers of fishing gear will also have to pay for the retrieval of any plastic nets that have been left at sea. There’s also a new focus on further raising public awareness, where producers of items such as tobacco filters, plastic cups, sanitary towels and wet wipes will be required to clearly explain to users how to appropriately dispose of them. The European Commission first proposed the ban in May , which was approved by member states in October. Dead whale found with 40 kilograms of plastic bags in its stomach China last year banned the import of 24 varieties of solid waste , including types of plastic and unsorted paper, putting pressure on Europe to deal with its own waste. The World Economic Forum estimates that there are about 150 million tons of plastic in the world’s seas. A study published in Science in 2015 suggested that between five and 13 million tons more are flowing into them every year. Research shows there will be more plastic than fish by weight in the world’s oceans by 2050, which has spurred policymakers, individuals and companies into action. European nations began phasing out plastic bags more than 15 years ago. Dozens of other countries and cities have already imposed bans or restrictions on plastic goods, including microbeads, plastic straws and coffee pods..
Vote by MEPs paves way for law to come into force by 2021 across EU. The European parliament has voted to ban single-use plastic cutlery, cotton buds, straws and stirrers as part of a sweeping law against plastic waste that despoils beaches and pollutes oceans. The UK environment secretary, Michael Gove, who has previously sparred with the European commission over who is doing the most to cut down plastic pollution , also wants to curb single-use plastics. As well as targeting the most common plastic beach litter, the directive will ban single-use polystyrene cups and those made from oxo-degradable plastics that disintegrate into tiny fragments. EU member states will have to introduce measures to reduce the use of plastic food containers and plastic lids for hot drinks. By 2025, plastic bottles should be made of 25% recycled content, and by 2029 90% of them should be recycled. The EU is also tackling the scourge of wet wipes that help to clog sewers in the form of “fatbergs”. Wet wipes, sanitary towels, tobacco filters and cups will be labelled if they are made with plastic. Packaging will warn consumers of environmental damage they do by disposing of these items incorrectly. The “polluter pays” principle will be extended to manufacturers of fishing nets so that companies – but not fishing crews – pay the cost of nets lost at sea. Frans Timmermans, a European commission vice-president, who has spearheaded the plan, said: “Today we have taken an important step to reduce littering and plastic pollution in our oceans and seas. We got this, we can do this. Europe is setting new and ambitious standards, paving the way for the rest of the world. At the sitting in Strasbourg, 560 MEPs voted in favour of the recent agreement hammered out with EU ministers, 35 against, with 28 abstentions. The directive only has to pass through formalities before it is published in the EU rulebook. Once that happens, EU member states will have two years to implement the directive. Every year, Europeans generate 25m tonnes of plastic waste, but less than 30% is collected for recycling. More than 80% of marine litter is plastic. 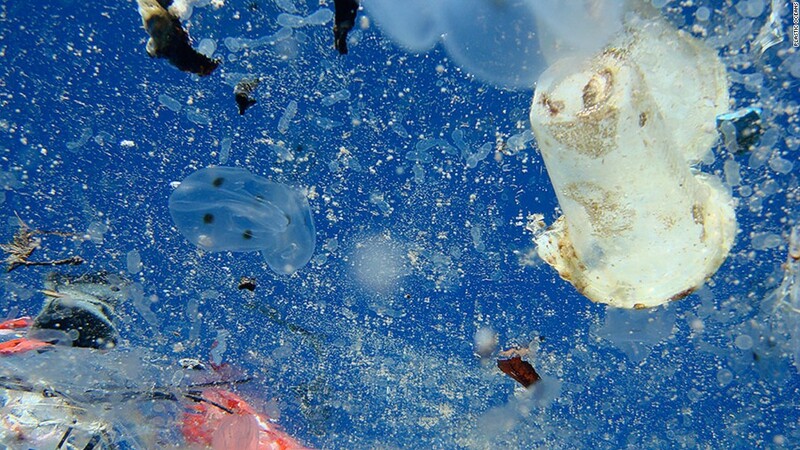 Topics Plastics European Union Marine life Oceans Pollution Europe Wildlife news.